Published in Current Affairs Bulletin, Vol. 59, No. 7, December 1982, pp. 14-26. Oh, we all will go together when we go. In the following article Dr Brian Martin, without belittling the horrendous effects of nuclear war, dispels a little of the gloom surrounding the subject - from Australia's point of view at least - by arguing that contrary to Tom Lehrer's assertions we may not 'all go together when we go'. While a full-scale nuclear war would devastate some parts of the earth, particularly in the northern hemisphere, present evidence indicates that 'nuclear war poses no threat to the survival of the human species'. Ever since the first nuclear bomb was exploded at Alamogordo, New Mexico, on 16 July 1945, the threat of nuclear war has existed. So far the only nuclear bombs used in war were the two dropped by the United States on Hiroshima and Nagasaki on the sixth and ninth of August 1945. Today the United States possesses some 30,000 nuclear weapons, the Soviet Union some 20,000, and China, France and Britain several hundred to a few thousand each. A few other countries such as Israel have or may soon have small nuclear arsenals. The Hiroshima and Nagasaki bombs killed a total of perhaps 300,000 people - different estimates have been offered. What would be the result of all-out nuclear war using today's weapon arsenals? This question has become more important in many people's minds in the 1980s as world attention has again focussed on the threat of nuclear war. In the immediate vicinity of a nuclear explosion, most casualties result from blast, heat and fallout during the first few days. The blast or heat from a one megatonne bomb - about 75 times the power of the Hiroshima bomb, and a size often found in nuclear arsenals - would kill almost all people, even those in shelters, out to a distance of two kilometres. Beyond ten kilometres the chance of death even for people without special protection would be very small. If the bomb is exploded at an altitude higher than the radius of the fireball from the explosion, as happened at Hiroshima and Nagasaki, local fallout is minimal. If exploded at or near the earth's surface, fallout lethal to unprotected people will be deposited downwind - most often to the east toward which prevailing upper atmospheric winds blow - for a distance of up to hundreds of kilometres. After a fortnight the radiation levels will have dropped to about one thousandth of what they were one hour after the blast. A major global nuclear war could kill up to 400-500 million people from these effects, mainly in the United States, Soviet Union and Europe, and to a lesser extent China and Japan. The death toll would depend on a range of factors, such as the areas actually hit by weapons and the extent of evacuation and fallout protection. This death toll would be made up mainly of the people in the immediate vicinity or downwind of nuclear explosions, and would total about ten percent of the world's population. This figure would be much higher if most of the largest population centres in countries all around the world were bombed, but there are no known plans for systematically bombing the largest population centres in areas such as India, Southeast Asia and China. On the other hand, if a nuclear war were limited in any sense - for example, restricted to Europe or to military targets - the immediate death toll would be less. If agricultural or economic breakdown or epidemics occurred in the aftermath of nuclear war, many more people could die, perhaps as many as a few hundred million in the worst case. These would be primarily in the most heavily bombed areas, namely the United States, Soviet Union and Europe. Nuclear war would also result in various long range effects, beyond the range of blast, heat and local fallout. These effects - effects hundreds or thousands of kilometres from nuclear explosions - are known as 'global' effects. The most well known is global radioactive fallout. Many people believe that this fallout, or some other effect, would cause the death of most or all the people on earth in the event of major nuclear war. This is the idea portrayed in the popular novel On the Beach. However, the available scientific evidence provides no support for such a doomsday scenario. My aim here is to describe in general terms the main global effects of nuclear war with direct consequences for human health. Four main categories will be treated: global fallout, ozone, climate and fires. When a nuclear bomb is exploded, energy is released by the fissioning (splitting) of either uranium-235 or plutonium. There are a range of products of this fissioning, many of which are radioactive - that is, they are unstable and decay sooner or later by emission of energetic radiation or particles. The most well-known fission product is strontium-90, which decays by emission of a beta particle. About half the strontium-90 nuclei decay in this way in a period of about 28 years, called the half-life. Different radioactive atoms have different half-lives, ranging from a fraction of a second to many millions of years. Other biologically important radioactive species produced by nuclear explosions are caesium-137 (half-life: 27 years), iodine-131 (half-life: eight days) and carbon-14 (half-life: 5600 years). A nuclear bomb like that exploded over Hiroshima produces a total of about 800 grammes of fission products, measured one hour after the blast. 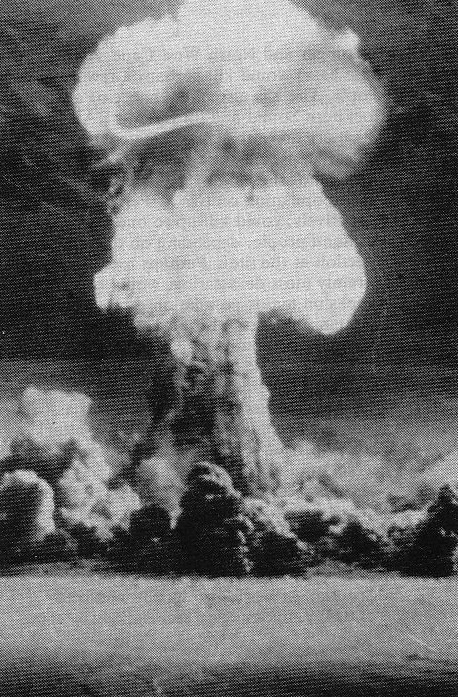 The enormous heat generated by the explosion creates a huge upwards surge of air, resulting in the familiar mushroom cloud. The height of the cloud depends on the size of the explosion (see Figure 1). Most of the fission products are carried into the atmosphere by this initial updraft. They become dangerous to humans when they return to earth. Figure 1. A typical configuration of the troposphere and stratosphere (divided by the dashed line) in July. The approximate heights of clouds from nuclear explosions of 20kt, 1Mt and 20Mt are sketched (widths are not to scale). The dotted line is a typical distribution of stratospheric ozone. If the bomb is exploded at or near the surface of the earth, a large amount of dust, dirt and other surface materials will also be lifted with the updraft. Some of the fission products will adhere to these particles, or onto the material used to construct the bomb. The very largest particles - stones and pebbles - will fall back to earth in a matter of minutes or hours. Lighter material - ash or dust - will fall to earth within a few days, or perhaps be incorporated in raindrops. The radioactive material which returns to earth within 24 hours is called early or local fallout. It is the most dangerous. As mentioned earlier, the fission products contain a mixture of different types of radioactive atoms, some of which decay quickly and others much more slowly. A rough rule of thumb is that as time increases by a factor of seven, the average decay rate drops by a factor of ten. Thus, compared to the decay rate one hour after the explosion, the rate will be about ten per cent at 7 hours, about one per cent at two days (about 7 x 7 hours), and about 0.1 per cent at two weeks (7 x 2 days). (After about six months the fall in the decay rate becomes faster than this.) For this reason, exposure to early fallout is the greatest danger due to radioactivity generated by nuclear explosions. Radioactive material which takes longer than 24 hours to return to earth is called delayed or global fallout. Some of the delayed fallout remains in the troposphere (see Figure 1) for days, weeks or months. This tropospheric fallout usually returns to earth within ten or 15 deg of latitude of the original explosion, mostly by being incorporated in raindrops as they are formed. The clouds of nuclear explosions larger than about one megatonne penetrate partially or wholly into the stratosphere, and deposit fission products there, which become stratospheric fallout. Since the stratosphere has no rain formation and is less turbulent than the troposphere, radioactive particles in the stratosphere can take months or years to return to earth. During this time the particles can move to any part of the globe. By the time stratospheric fallout reaches the earth, its radioactivity is greatly reduced. For example, after one year, the time typically required for any sizable amount of fission products to move from the northern to the southern stratosphere, the rate of decay will be less than a hundred thousandth of what it was one hour after the blast. It is for this reason that stratospheric fallout does not have the potential to cause widespread and immediate sickness or death. A dose of ionising radiation of four to five sieverts to the body of a person at a single time is enough to cause death in about half the people exposed to it. Doses of one to two sieverts cause sickness, while a dose of one half sievert often causes no overt symptoms, though it may have long term effects. For comparison, the average annual ionising radiation dose to individuals from 'natural' causes - from cosmic rays, radioactivity in rocks and other sources - is about one thousandth of a sievert (one millisievert). An average of another millisievert is contributed, for those with Western lifestyles, by sources of human origin, mainly medical x-rays. What ionising radiation exposure would result from a major nuclear war? In the 1950s and early 1960s a large number of nuclear weapons were exploded in the atmosphere - a total of 430 megatonnes (Mt). This has led and is leading to an average ionising radiation exposure, both external and internal, of about two millisieverts over 30 years for people in the northern hemisphere, and about one-third this level in the southern hemisphere. A major nuclear war resulting in the explosion of 4000Mt (see "Explosive power in a nuclear war") would, according to simple scaling, lead to an average exposure ten times as great as occurred from previous tests. Many of the 1950s-1960s explosions were very high yield, up to 60Mt, but most nuclear weapons are now 2Mt or smaller. Therefore, stratospheric fallout from a 4000Mt war would probably be less than ten times as great as from previous atmospheric tests. Furthermore, because material injected into the lower stratosphere is less likely to move great distances before returning to the troposphere, relative fallout levels in the southern hemisphere due to northern hemisphere explosions are likely to be smaller than the previous one-third ratio. The lower injection of radioactive material into the stratosphere means correspondingly higher levels of tropospheric fallout, especially near the latitudes of the explosions. Since tropospheric fallout returns to earth more quickly than stratospheric fallout, it is more radioactive and dangerous. Thus the shift to lower yield nuclear weapons has reduced the health risk of nuclear war from radioactivity to people who are far from the main regions of nuclear conflict, but increased it for those near the latitudes of numerous nuclear explosions. These conclusions are tentative, since it is possible that the rapid explosion of 4000Mt of nuclear weapons could greatly alter the atmospheric circulation, with unknown consequences for the distribution of fallout. There are two main hazards from exposure to low levels of ionising radiation: cancers and genetic defects. In essence, the energetic radiation and particles from radioactive decay can disrupt the structure of cells in the body or in genetic material, causing or contributing to cancer or genetic defects. For several decades, a scientific controversy has raged over the effect of exposure to low levels of ionising radiation. Since the cancers and genetic defects caused by this radiation are usually impossible to distinguish from cancer and genetic defects due to other causes, available evidence is not adequate to measure the effect at low doses. The controversy concerns which theory is most appropriate to use to extrapolate from evidence at higher exposures (above one-half to one sievert). An authoritative report on the effect of ionising radiation, called Beir III, concludes that exposure of the whole body to 100 millisieverts will result in an increase in the naturally occurring cancer death rate of 0.5 per cent to 1.4 per cent, and 50 to 750 additional serious genetic disorders per million live births. An average exposure of 20 millisieverts from delayed fallout from a nuclear war could, according to these figures, cause 600,000 to 1,700,000 additional cancer deaths and 40,000 to 600,000 additional genetic defects, manifested over a period of 50 years or more. Figures on risks of cancer and genetic defects from exposure to ionising radiation used by the International Commission on Radiological Protection for radiation protection purposes lie within the range of uncertainty specified by the Beir report. If the effects of carbon-14 over many thousands of years are included, these figures should be doubled. There were two dissenting statements in Beir III, one suggesting the estimates are too high and the other that they are too low. Recent evidence on ionising radiation and cancer appears to support the latter view. Recent evidence also suggests that the Beir III figures for genetic defects may be too large. In any case, the figures are very uncertain, and could easily be ten times too small or ten times too large. Nuclear power reactors contain an enormous amount of radioactive material. Much attention has been focussed on the possibility that reactor containment systems might fail, leading to escape of radioactivity and the possible death of up to tens of thousands of people. The meltdown and dispersal of a portion of the core of a nuclear power reactor could readily result from attack on a nuclear power plant by conventional or nuclear weapons which disabled cooling and other control systems. Even more devastating, though, would be the result of direct hit by a nuclear weapon on a nuclear power reactor, with the nuclear reactor's radioactive inventory being directly incorporated into the fireball of the nuclear explosion. This inventory would then be incorporated into the fallout cloud from the explosion. The short-lived decay products in the reactor mostly decay away during its operation, leaving the longer-lived products such as strontium-90 and caesium-137. Therefore, while the radioactivity from a one megatonne nuclear explosion remains higher than that from a large (1000MW) nuclear power reactor for a few days, afterwards the reactor's radioactivity poses a greater danger. If many reactor cores were vapourised in this way, large areas of countryside could be made highly radioactive for long periods of time. It is possible that nuclear power reactors would be nuclear targets, because of their high economic value, because of their capability of producing plutonium for making nuclear weapons, or because of the devastating radioactivity that would be spread about. The latter effect could also be achieved by attacking radioactive waste repositories or reprocessing plants. The main concentrations of large nuclear reactors are found in the United States, Europe, the Soviet Union and Japan, that is, those areas most likely to be involved in nuclear war in any case. If nuclear power facilities were attacked, therefore, most of the extra deaths and injuries would result in those regions. Because reactor cores are very well protected, dispersal of the core materials is unlikely to occur unless they are the specific target of highly accurate weapons. One special product of nuclear explosions is plutonium. Plutonium-239 is a fissionable substance and is used to construct nuclear weapons. It is also a highly dangerous radioactive material. It decays by emitting an alpha particle, which cannot penetrate a piece of paper or the skin. But once inside the body, plutonium-239 is a potent cancer-inducing agent. Experiments have shown that less than one milligramme of insoluble plutonium oxide is definitely enough to cause lung cancer in beagle dogs. It is not known how much plutonium is required to induce lung cancer in humans, but estimates as low as a few millionths of a gramme have been made. Previous nuclear explosions have injected an estimated 5 tonnes of plutonium into the atmosphere. No one knows what effect this is having on human health. One of the highest estimates of the consequences is by John Gofman, who thinks 950,000 people worldwide may die of lung cancer as a result of this plutonium, over a period of many decades. A 4000Mt nuclear war could cause the release of ten times as much plutonium, some 50 tonnes, with ten times the consequences. Large nuclear power reactors contain an average inventory of perhaps 300 kilogrammes of plutonium. If it is assumed that all the plutonium from 20 large reactors - more than one tenth of the world total - were dispersed in a 4000Mt nuclear war, this would add another six tonnes of plutonium to the total released into the atmosphere. This would be about one tenth the amount directly released by the nuclear explosions themselves. The cancers and genetic defects caused by global fallout from a nuclear war would only appear over a period of many decades, and would cause only a small increase in the current rates of cancer and genetic defects. The scientific evidence clearly shows that global fallout from even the largest nuclear war poses no threat to the survival of the human species. Nevertheless, the fact that hundreds of thousands or millions of people who would suffer and die from global fallout cannot be ignored. Furthermore, many more people than this would die from exposure to fallout in the immediate vicinity of nuclear explosions. The sun emits light or radiation at a large range of energies or frequencies. Much of this radiation is absorbed by the earth's atmosphere and does not reach the surface. Human eyes have evolved to be highly receptive to radiation in the so-called visual spectrum which is not absorbed very much at all by the atmosphere. At the violet, high-energy end of this band of transmitted light lies what is called ultraviolet light or uv. Ultraviolet light with high energies is strongly absorbed by molecular oxygen - the oxygen we breathe - in the upper atmosphere. This absorption can cause the molecular oxygen to break into two oxygen atoms each of which in turn can react with other molecular oxygen to form ozone, a compound made up of three oxygen atoms. In turn, ozone strongly absorbs ultraviolet light itself, including uv with energies lower than that absorbed by molecular oxygen. Small amounts of uv can be beneficial, especially in forming vitamin D in the skin. But large amounts can be harmful, especially of the more energetic uv, causing sunburn and skin cancer in humans and adversely affecting the growth of many plants. Many scientists believe that much of biological evolution took place under the protective uv shield of upper atmospheric ozone. In the early 1970s scientists first became aware that oxides of nitrogen play a large role in reducing ozone levels through catalytic destruction: a single nitric oxide molecule can help destroy many molecules of ozone without being destroyed itself. This knowledge soon led to concern about the effects of oxides of nitrogen from supersonic transport aircraft (SSTs) on ozone and led to studies on this problem and later to studies of other threats to ozone such as from fluorocarbons from aerosol sprays and refrigerants. Another major threat to ozone comes from nuclear explosions. Nitric oxide is produced essentially by the 'burning' of nitrogen in the atmosphere, and this occurs whenever air temperatures are sufficiently hot: in automobile engines, in aircraft engines and in nuclear explosions. Studies of the creation of oxides of nitrogen by nuclear explosions were first undertaken as part of the SST debate, to determine whether the nuclear weapons tests in the 1950s and 1960s had reduced observed ozone levels. It was only in 1974 that John Hampson made a point which had been overlooked, namely that large-scale nuclear war could cause a major and disastrous reduction in ozone levels. Calculations made in the mid-1970s assuming large nuclear arsenals with many high-yield explosions concluded that reductions of ozone could reach 50 per cent or more in the northern hemisphere, with smaller reductions in the southern hemisphere. But since the number of high-yield weapons in present nuclear arsenals is now smaller, much less oxides of nitrogen would be deposited in the stratosphere by nuclear war than assumed in earlier calculations, and so significant ozone reductions are unlikely. This conclusion remains tentative. The actual behaviour of stratospheric ozone is quite complicated, involving many chemical compounds and numerous chemical reactions, the changing effects of temperature, the angle and intensity of sunlight, and the effect of air motions. Computer models of the effects of nuclear war on ozone are able to take into account only a part of this complexity, and new information about chemical reaction rates in particular have led in the past to periodic revisions in the calculated effects of added oxides of nitrogen. If significant ozone reduction did occur, the most important direct effect on humans would be an increase in skin cancer. However, this is seldom lethal, and could be avoided by reducing exposure to sunlight. Potentially more serious would be effects on crops. Some of the important grains, for example, are sensitive to uv. Whether the net effects on crop yields would be significant is hard to estimate. But whatever the reduction in ozone, ozone levels would return pretty much to normal after a few years. It seems unlikely that in the context of a major nuclear war the changes in uv alone would be of serious concern. In particular, the threat of human extinction raised by Jonathan Schell in The Fate of the Earth, based mostly on effects of increased uv from ozone reduction, seems very small indeed. It is sometimes claimed that nuclear war could destroy ozone to such an extent that humans and animals would be blinded by excess uv. Even if large numbers of high-yield weapons were exploded, this possibility seems very unlikely except for a contribution to snow blindness in the far north. Stratospheric ozone can never be completely removed, but at most reduced greatly. Even if a 50 per cent or more reduction in ozone occurred - and as noted this seems improbable with present nuclear arsenals - protection from uv for humans could be obtained from sunglasses or just ordinary glasses, which absorb uv. For animals, the following considerations are relevant. Ozone levels vary considerably from place to place and from time to time, both seasonally and daily (sometimes by up to 50 per cent). Sunlight at the equator typically passes through only half as much ozone as at the mid-latitudes, yet animals at the equator are not known to go blind more often than elsewhere. Furthermore, most ozone reductions from a nuclear war would be in the mid and high latitudes, where ozone levels are higher to start with and where the 'path length' of sunlight through ozone is increased due to its oblique angle of incidence. But this does not mean complacency is warranted, as the concerns of John Hampson illustrate. The brief treatment given so far about the likely effects of nuclear war on ozone has presented for the most part the conventional scientific wisdom on this topic. But there is room for disagreement. One of those who think that scientists may be underestimating the danger is John Hampson, who originally raised the alarm about the effects of nuclear war on ozone. Here some of Hampson's views will be outlined, both to present his provocative ideas and to illustrate the large imponderables associated with present understanding of the global effects of nuclear war. Hampson's first major point is that the standard values given for the amount of oxides of nitrogen deposited by nuclear weapons in the upper atmosphere may be underestimated. He notes that one of the few observations of oxides of nitrogen in the wake of high-yield nuclear tests can be explained if four times as much oxides of nitrogen are produced in nuclear explosions as found in other studies, and that all this is deposited in the stratosphere. Hampson's second major point is that a major ozone reduction might be caused by detonation of nuclear weapons at high altitudes. Because of the low atmospheric density at say 100 kilometres, much of the high level gamma radiation produced by a nuclear explosion will will produce x-rays which penetrate to about 40 kilometres. Because of the low atmospheric density, a large fraction of the bomb's energy can go to produce oxides of nitrogen, perhaps up to 20 times as much as from a surface explosion. If the oxides of nitrogen remained at 40 kilometres altitude, they would not cause a large reduction in total ozone, since much ozone resides at lower altitudes (see Figure 1). But since the ozone in the 40 kilometre region would be greatly reduced, absorption of uv by ozone would be reduced and the upper stratosphere would be quickly cooled. This would result in upper stratospheric instability. Hampson thinks that the cloud of oxides of nitrogen would sink by maybe one kilometre per day, reaching the peak ozone altitude of 30 kilometres in 10 days. If enough explosive power were released, the result could be a drastic reduction in ozone levels. Hampson considers several scenarios in which high altitude explosions might play a role. One scenario involves antiballistic missiles (ABMs). The Soviet Union has a set of ABMs around Moscow, designed to intercept incoming missiles by exploding their own nuclear weapons at high altitudes. Hampson suggests that if these ABMs were used accidentally, perhaps after a false alarm, a large amount of oxides of nitrogen could be produced in the upper stratosphere. In the ten or 15 days required for the oxides of nitrogen to settle down to 30 kilometres, the oxides of nitrogen cloud would have blown by prevailing upper atmospheric winds over North America, which might be exposed to intense uv for a week or so. This scenario raises the possibility of using an apparently 'inadvertent' use of ABMs or other nuclear explosions as a form of environmental warfare by creating localised depletions in the ozone layer. Hampson agrees that high uv levels do not pose a serious direct threat to human health. But he is less optimistic about effects on the biosphere. He has his own ideas, contrary to the current scientific orthodoxy, about the evolution of the ozone layer in the history of the earth, and the evolution of life under it. Among many points he raises, he thinks that studies of the impact of changes in ozone should begin with organisms he calls procarytoids, which are capable of forming amino acids directly from natural elements. He thinks it should be determined whether increased uv from ozone reductions could eliminate procarytoids, and whether humans could survive without their existence. Hampson's views are outlined here not as established fact - which they are not - but to show the sort of dangers which may exist unrecognised by prevailing scientific views. It is a telling commentary on scientific research priorities that the possibilities raised by Hampson - and many others - are receiving almost no study by scientists. There are several reasons for this. One is simply that there is much more money available for studying how to wage nuclear war - for example, how to make smaller nuclear weapons or more accurate missile guidance systems - than for studying the human consequences of nuclear war. Second, Hampson's ideas are somewhat outside the main stream of scientific thought about ozone and production of oxides of nitrogen. It is difficult enough to obtain jobs and research grants to study the effects of nuclear war even when staying firmly within prevailing scientific ideas. Third, Hampson's concerns involve a close intermeshing of scientific and strategic factors. For example, the current hazard from high altitude ABM explosions is being reduced: of the original 64 Galosh ABMs around Moscow, 32 have been dismantled. But an investigation of Hampson's arguments would be unwelcome to military decision-makers, who would not want to be constrained in any use of high-yield weapons or deploying of future ABMs. Fourth, to study the issues raised by Hampson would require an interdisciplinary person or team, involving knowledge of non-equilibrium reaction kinetics, stratospheric chemistry and dynamics, ozone history and evolution, and nuclear strategies. Finally, Hampson himself lacks credibility and pull because, in spite of a long and productive scientific career, he has no current scientific or academic position. Although in principle scientific ideas are judged by their merit, independently of who presents them, scientific practice is different. Obtaining attention, credibility and funds depends substantially on one's formal position and political sway within the power structure of science. A major nuclear war would deposit millions of tonnes of dust in the stratosphere. Some sunlight would be absorbed or reflected away from the earth by the dust, causing a decrease in the earth's temperature. This in turn could conceivably trigger a major climatic change. For example, lowered temperatures could cause an increase in snow and ice near the polar caps, thus an increased reflection of light, and further lowering of temperatures. Stratospheric dust from a nuclear war seems unlikely to cause such climatic change. In 1883 the volcanic eruption at Krakatoa deposited some 10 to 100 thousand million tonnes of dust in the stratosphere, and the 1963 Mt Agung eruption about half as much. These injections seem to have caused a minor cooling of the surface temperature of the earth, at most about half a degree Celsius, lasting a few years, with no long term consequences. A nuclear war involving 4000Mt from present arsenals would probably deposit much less dust in the stratosphere than either the Krakatoa or Mt Agung eruptions. Another possibility is that decreases in ozone or increases in oxides of nitrogen levels in the stratosphere, caused by nuclear war, could lead to climatic change. A reduction in ozone levels by a factor of two could cause a decrease in surface temperature of one half to one degree Centigrade, but including oxides of nitrogen in the calculation reduces this effect. Whether or not a change in temperature at the earth's surface by this amount for a few years could cause irreversible climatic change is hard to assess. The National Academy of Sciences study concluded that the effects of dust and oxides of nitrogen injection into the stratosphere 'would probably lie within normal global climatic variability, but the possibility of climatic changes of a more dramatic nature cannot be ruled out'. Since the Academy assumed a nuclear war with the explosion of many more high-yield weapons than are presently deployed, the danger of climatic change from dust or oxides of nitrogen is almost certainly less than assessed in their report. In mid 1982, Paul Crutzen and John Birks drew attention to a previously overlooked major effect of nuclear war. They note that nuclear attacks would ignite numerous fires in cities, industry and especially in forests, crop areas and oil and gas fields. These fires would produce immense amounts of particulate matter which would remain in the lower atmosphere for weeks even after the fires ceased. The smaller particles, called aerosols, would absorb sunlight. A large nuclear war with many fires and large aerosol production could lead to a reduction in sunlight in the mid-northern hemisphere by 90 per cent or more for a period of a few months. This reduction would pose no direct threat to human health, but indirect effects could be widespread. If the nuclear war occurred during the agricultural growing season of the northern hemisphere, food production could be virtually eliminated for that season. This could greatly increase the chance of mass starvation in the north, though it is possible that stored food and changes in dietary habits could prevent this. If the reduction in ground level sunlight were 99 per cent or more, this could lead to the death of most of the phytoplankton and herbivorous zooplankton in half the northern oceans. This could lead to extinction of species and unpredictable changes in the balance of life on earth. Another effect of the fires would be production of large amounts of oxides of nitrogen and reactive hydrocarbons in the lower atmosphere, changes in lower atmospheric dynamics, and creation of ozone and other potent air pollutants. (While ozone plays a useful role in the stratosphere it can be harmful to living things at ground level.) In effect, much of the northern hemisphere could be exposed to severe photochemical smog for a period of weeks. This could cause health problems in susceptible people, especially the aged. Potentially more disastrous would be the negative effect of the smog on agricultural productivity, further increasing the chance of crop failure and consequent starvation. from fires, a negligible effect. But this conclusion does not mean that the global effects should be ignored by Australians. First, many people will die worldwide from cancers and genetic defects caused by global fallout, and possibly from other global effects. Whether the total is 10,000 or 10,000,000, the suffering and death will be real for those who experience it, and should not be discounted by use of comparisons. Second, there does exist a chance that major climatic changes, alterations in agricultural productivity, or consequences for global ecology could result from nuclear war. Third, simply not enough is known to predict with confidence all the global effects of nuclear war. The implications for ozone were not publicised until 1974 and the consequences of fires were first publicised in 1982. This suggests that further significant effects may remain to be discovered. Furthermore, the exact consequences of known processes are a subject of scientific controversy. John Hampson's scenario for possible inadvertent destruction of ozone in a local region is an example of what may happen within the limits of scientific possibility. Until much more study is made of the effects of nuclear war, a high level of uncertainty will remain. Fourth, whatever the scale of global effects of nuclear war, the potential for immediate death and destruction in areas directly attacked is more than sufficient to justify the most strenuous efforts to eliminate the nuclear threat. Nuclear war will hit hardest at the areas bombed, not only directly from blast, heat and local fallout but also from delayed tropospheric fallout, fires and possible agricultural or economic breakdown. Since physical effects far from the regions of nuclear explosions are much less, the most important threat to a country such as Australia is direct nuclear attack. The prime targets in Australia are the United States military bases at Pine Gap, Nurrungar and North West Cape. Attacks on these bases would kill perhaps a few thousand people. There is a smaller chance of attacks on Cockburn Sound and on Darwin RAAF base, which are hosts for United States strategic nuclear ships, submarines and aircraft. Nuclear bombing of these two facilities, which are close to the population centres of Perth and Darwin respectively, could kill up to one hundred thousand people, depending on the wind direction at the time. Perhaps least likely, but certainly most devastating, would be nuclear attacks on major population centres. For example, the ports of major Australian cities could well be bombed if United States warships carrying strategic nuclear weapons were in harbour. Major population centres might also be hit as a consequence of attacks on associated military or economic facilities. Such attacks could kill from a few hundred thousand to several million people. In the absence of direct attacks, the major indirect effects of nuclear war on a country such as Australia would not be physical but economic, political and social. Economically, nuclear war would cause an enormous disruption of world production and trade. Politically, nuclear war seems likely to cause massive upheavals not only in countries directly involved but in many of those far from the direct destruction. The social effects of nuclear war would be many, and include the psychological effects of massive nuclear destruction and the more immediate stresses of large numbers of refugees from Europe and North America. Study of and planning for these non-physical effects of nuclear war has been meagre or nonexistent. But unless the almost total lack of progress towards nuclear disarmament since 1945 is somehow reversed, these possible effects seem certain to become reality sooner or later. The nuclear bomb exploded over Hiroshima had an explosive power of about 13 kilotonnes, denoted 13kt. One kt is the equivalent of one thousand tonnes (of one thousand kilogrammes each) of chemical explosives. The Hiroshima bomb was an enriched uranium fission bomb and the Nagasaki bomb of 21kt was a plutonium fission bomb. Much greater explosive power can be obtained by using an enriched uranium fission explosion as a trigger to cause nuclear fusion in a mixture of lithium and deuterium (heavy hydrogen). This is the thermonuclear, fusion, hydrogen or H-bomb. Unenriched uranium is often put around the fusion bomb to absorb emitted neutrons and cause further fissions and thus increase explosive power. This is the standard fission-fusion-fission bomb, whose explosive power is usually measured in megatonnes (denoted Mt), with 1Mt equal to 1000kt. The largest atmospheric nuclear explosion was one by the Soviet Union in 1961, of about 60Mt yield. A typical large-sized nuclear explosive in the 'strategic' arsenals of the United States or the Soviet Union used to be about 1Mt, and many weapons of this size are deployed today in the payloads of ballistic missiles. The trend in the United States for the past decade or so, and in the Soviet Union for a few years, has been to switch from a single large warhead to several smaller warheads in the payload of strategic ballistic missiles. For example, a single 1Mt bomb might be replaced by ten 50kt bombs, each independently targetable. In this case this change reduces total explosive power by one half, while the total surface area that potentially can be destroyed is increased by one third. The overwhelming bulk of nuclear explosive power resides in the arsenals of the two nuclear superpowers, the United States and the Soviet Union. In 1960 this explosive power totalled perhaps 60,000Mt. But due to the trend noted above, present arsenals total about 11,000Mt: about 3,500Mt for the United States and 7,500Mt for the Soviet Union. While the trend to larger numbers of smaller warheads increases the potential area destroyed by nuclear weapons, the reduction in total megatonnage reduces the potential global effects. This is especially the case since the clouds from nuclear explosions of 1Mt or less are unlikely to rise high into the stratosphere, reducing stratospheric fallout and effects on ozone. What fraction of the 11,000Mt would be exploded in a major nuclear war? This is hard to assess, but almost certainly much will not be exploded. Both the United States and the Soviet Union place a high priority on targeting their opponent's military forces, nuclear forces in particular. A sizable fraction of nuclear arsenals is likely to be destroyed before use (attacks on nuclear submarines, airfields, missile silos), be unavailable for use (submarines in port, missiles cut off from communications) or fail to perform properly. One estimate is that one sixth to one third of superpower arsenals will be used, depending on whether the war occurs suddenly or builds up gradually. If these estimates are correct then about 2000Mt to 4000Mt of nuclear firepower might be exploded in a major nuclear war. The total could be much smaller in a 'limited' nuclear war. The figure of 4000Mt is used in this article in making illustrative calculations. It is assumed that half of this total is due to fission and half to fusion. Many people believe that the capacity of nuclear weapons for 'overkill' means that all or most of the people on earth would die in a major nuclear war. In spite of the prevalence of this idea, there is little scientific evidence to support it. Many calculations of 'overkill' appear to be made using the nuclear attacks on Hiroshima and Nagasaki as a baseline. Estimates of the number of people killed at Hiroshima from a 13kt bomb range from 63,000 to over 200,000. Adopting a figure of 130,000 for illustrative purposes gives ten people killed for each tonne of nuclear explosive. By linear extrapolation, explosion of a third of a million times as much explosive power, 4000Mt, would kill a third of a million times as many people, namely 40,000 million, or nearly ten times the present world population. But this factor of ten is misleading, since linear extrapolation does not apply. Suppose the bomb dropped on Hiroshima had been 1000 times as powerful, 13Mt. It could not have killed 1000 times as many people, but at most the entire population of Hiroshima perhaps 250,000. Re-doing the 'overkill' calculation using these figures gives not a figure of ten but of only 0.02. This example shows that crude linear extrapolations of this sort are unlikely to provide any useful information about the effects of nuclear war. 'Overkill' can be meaningful if applied to specific targets which will be attacked by several nuclear weapons. But applied to the entire world population the concept of 'overkill' is misleading. By the same logic it might be said that there is enough water in the oceans to drown everyone ten times. It has been argued that if the megatonnage in nuclear arsenals were increased by ten or 100 times and used in war, the fallout would be sufficient to threaten the life of most people on earth. Since total megatonnage has been decreasing in recent years, this particular possibility remains hypothetical, at least at the moment. The author wishes to thank the following for valuable comments on this paper: Desmond Ball, Ian Bassett, Paul Crutzen, Mark Diesendorf, John Hampson, Barrie Pittock and others who prefer to remain anonymous. 1 United Nations, Nuclear Weapons: Report of the Secretary-General, Autumn Press, Brookline, Massachusetts, 1981; Stockholm International Peace Research Institute, World Armaments and Disarmament: SIPRI Yearbook 1982, Taylor and Francis, London, 1982; International Institute for Strategic Studies, The Military Balance 1981-1982, London, 1981. 2 United Nations, (see footnote 1), p.63. 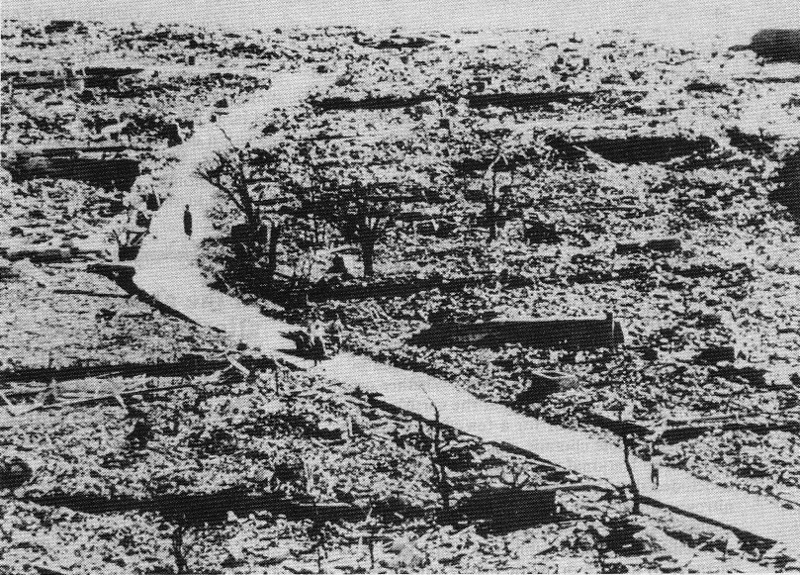 Estimates for Hiroshima alone range from 63,000 to 240,000 or more: Robert Jay Lifton, Death in Life: the Survivors of Hiroshima, Weidenfeld and Nicolson, London, 1968, p.20. 3 Samuel Glasstone and Philip J. Dolan (editors), The Effects of Nuclear Weapons, United States Department of Defense and Energy Research and Development Administration, Washington, D.C., 1977. Further information here about the direct effects of nuclear weapons is taken from this basic reference. 4 Office of Technology Assessment, Congress of the United States, The Effects of Nuclear War, Croom Helm, London, 1980; Alain C. Enthoven, 'U.S. Forces in Europe: How Many? Doing What? ', Foreign Affairs, Vol. 53, No. 3, April 1975, p.525. 5 Ambio advisors, 'Reference Scenario: How a Nuclear War Might be Fought', Ambio, Vol. 11, Nos. 2-3, 1982, pp.94-99. 7 See several of the articles in Ambio, Vol. 11, Nos. 2-3, 1982, and Arthur M. Katz, Life After Nuclear War: the Economic and Social Impacts of Nuclear Attacks on the United States, Ballinger, Cambridge, Massachusetts, 1982. 8 Nevil Shute, On the Beach, Heinemann, Melbourne, 1959. 9 On global fallout see especially Long-Term Worldwide Effects of Multiple Nuclear-Weapons Detonations, National Academy of Sciences, Washington, D.C., 1975; Glasstone and Dolan; footnote 1; Joseph Rotblat for Stockholm International Peace Research Institute, Nuclear Radiation in Warfare, Taylor and Francis, London, 1981. 10 Carbon-14 is not a fission product, but is formed when neutrons from the nuclear explosion are captured by nitrogen in the atmosphere. 11 Kendall R. Peterson, 'An Empirical Model for Estimating World-wide Deposition from Atmospheric Nuclear Detonations', Health Physics, Vol. 18, 1970, pp.357-378. 12 The use of the time of 24 hours to distinguish between early and delayed fallout is arbitrary and has no special physical significance. 13 One sievert is defined as one joule of energy from ionising radiation absorbed per kilogramme of tissue. One sievert equals 100 rem. 14 The Effects on Populations of Exposure to Low Levels of Ionizing Radiation: 1980 [Beir III], National Academy Press, Washington, D.C., 1980. 15 'Recommendations of the International Commission on Radiological Protection', Annals of the ICRP, Vol. 1, No. 3 (ICRP Publication 26), 1977. 16 Harald H. Rossi, pp.254-260 and Edward P. Radford, pp.227-253, in Beir III, (see footnote 14). 17 Eliot Marshall, 'New A-bomb Studies Alter Radiation Estimates', Science, Vol. 212, 22 May 1981, pp.900-903. 18 William J. Schull, Masanori Otake and James V. Neel, 'Genetic Effects of the Atomic Bombs: a Reappraisal', Science, Vol. 213, 11 September 1981, pp.1220-1227. 19 See for example Walter C. Patterson, Nuclear Power, Penguin, Harmondsworth, 1976. 20 Steven A. Fetter and Kosta Tsipis, 'Catastrophic Releases of Radioactivity', Scientific American, Vol. 244, No. 4, April 1981, pp.33-39; Bennett Ramberg, Destruction of Nuclear Energy Facilities in War: the Problem and its Implications, Lexington Books, Lexington, Massachusetts, 1980; Conrad V. Chester and Rowena O. Chester, 'Civil Defense Implications of the U.S. Nuclear Power Industry During a Large Nuclear War in the Year 2000', Nuclear Technology, Vol. 31, December 1976, pp.326-338. 21 W. J. Bair and R. C. Thompson, 'Plutonium: Biomedical Research', Science, Vol. 183, 22 February 1974. 22 E. P. Hardy, P. W. Krey and H. L. Volchok, 'Global Inventory and Distribution of Fallout Plutonium', Nature, Vol. 241, 16 February 1973, pp.444-445. On the production of plutonium in nuclear explosions see Rotblat, (see footnote 9), pp.77-78. 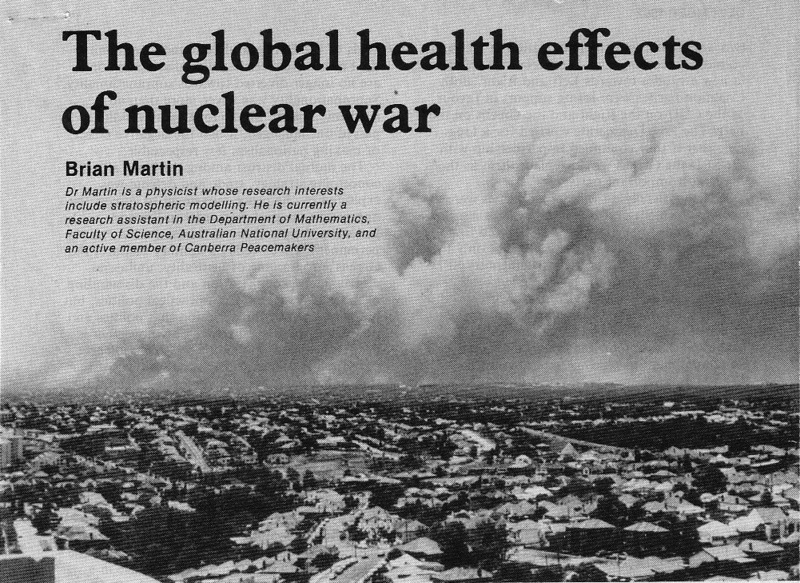 23 John W. Gofman, Radiation and Human Health, Sierra Club Books, San Francisco, 1981, pp.495-520. 25 The oxides of nitrogen are nitric oxide or NO and nitrogen dioxide or NO2. The two reactions in the catalytic cycle for destruction of ozone or O3 are NO + O3 -> NO2 + O2 and NO2 + O -> NO + O2. The net effect is O3 + O -> O2 + O2, with the NO remaining to react in another cycle. 26 A. J. Grobecker, S. C. Coroniti and R. H. Cannon, Jr., Report of Findings: the Effects of Stratospheric Pollution by Aircraft, U.S. Department of Transportation, Washington, D.C., 1974. 27 See for example Halocarbons: Environmental Effects of Chlorofluoromethanes Release, National Academy of Sciences, Washington, D.C., 1976. 28 H. M. Foley and M. A. Ruderman, 'Stratospheric NO Production from Past Nuclear Explosions', Journal of Geophysical Research, Vol. 78, 1973, pp.4441-4450; P. Goldsmith, A. F. Tuck, J. S. Foot, E. L. Simmons and R. L. Newson, 'Nitrogen Oxides, Nuclear Weapon Testing, Concorde and Stratospheric Ozone', Nature, Vol. 244, 31 August 1973, pp.545-551; Harold S. Johnston, Gary Whitten and John Birks, 'Effect of Nuclear Explosions on Stratospheric Nitric Oxide and Ozone', Journal of Geophysical Research, Vol. 78, 1973, 6107-6135. 29 John Hampson, 'Photochemical War on the Atmosphere', Nature, Vol. 250, 19 July 1974, pp.189-191. 30 National Academy of Sciences, note 9; R. C. Whitten, W. J. Borucki and R. P. Turco, 'Possible Ozone Depletions following Nuclear Explosions', Nature, Vol. 257, 4 September 1975, pp.38-39. 31 Paul J. Crutzen and John W. Birks, 'The Atmosphere after a Nuclear War: Twilight at Noon', Ambio, Vol. 11, Nos. 2-3, 1982, pp. 114-125 (see Scenario 1, p. 121). The Ambio reference scenario (see footnote 5) contains fewer high yield explosions than are likely in an actual major nuclear war, so the actual effect on ozone would be larger than the negligible effect found by Crutzen and Birks. 32 National Academy of Sciences, (see footnote 9); Evans E. Koslow, 'An Aposematic Statement on Nuclear War: Ultraviolet Radiation in the Postattack Environment', BioScience, Vol. 27, No. 6, June 1977, pp.409-413. 33 Jonathan Schell, The Fate of the Earth, Alfred A. Knopf, New York, 1982, especially p.93. 34 Hampson, note 29 and many personal communications. For copies of some of Hampson's unpublished analyses, write to the author: Brian Martin, Department of Mathematics, Faculty of Science, Australian National University, P.O. Box 4, Canberra ACT 2600. [from 1986: STS, University of Wollongong, NSW 2522, Australia]. 35 K. Ya. Kondrat'yev and G. A. Nikol'skiy, 'Solar Activity and the Climate', Doklady Akad. Nauk SSSR, Vol. 243, 1978, pp.18-21. 36 International Institute for Strategic Studies, (see footnote 1), p.11. 37 Theodore Caplow and Reece J. McGee, The Academic Marketplace, Basic Books, New York, 1958, especially p. 128. 38 National Academy of Sciences, (see footnote 9). 39 National Academy of Sciences, (see footnote 9), p.7. 40 Crutzen and Birks, (see footnote 31). 41 R. S. Pogrund, Nutrition in the Postattack Environment, Rand Corporation, Santa Monica, December 1966; Peter Laurie, Beneath the City Streets, Granada, London, 1979, pp.158-164. 42 Calculated as follows: 0.02 sievert per person multiplied by one third (southern hemisphere has lower exposure) times 0.01 deaths per sievert (ICRP figure: see footnote 15) times 15,000,000 people (population of Australia) equals 1000 deaths. Further deaths would result from genetic defects, but the one third factor should be smaller due to the smaller fraction of high-yield weapons in present nuclear arsenals. The final figure is quite uncertain, and could easily be incorrect by a factor of ten. 43 Desmond Ball, 'Target Australia? No 1: Pinpointing the US Installations', Pacific Defence Reporter, Vol. 8, No. 3, September 1981, pp.25-33; D. W. Posener, 'Target Australia? No 3: Planning for Radiological Defence', ibid., pp.42-52; Desmond Ball, 'Limiting Damage from Nuclear Attack', in Desmond Ball and J. O. Langtry (editors), Civil Defence and Australia's Security, Australian National University, Canberra, 1982. 44 Brian Martin, 'How the Peace Movement Should be Preparing for Nuclear War', Bulletin of Peace Proposals, Vol. 13, No. 2, 1982, pp.149-159. 45 United Nations, (see footnote 1); Arthur H. Westing for Stockholm International Peace Research Institute, Weapons of Mass Destruction and the Environment, Taylor and Francis, London, 1977, p.2. See Westing's note (pp.24-26) on the difference between kilotons and kilotonnes. 46 Desmond Ball, 'The Future of the Strategic Balance', in Lawrence S. Hagen (editor), The Crisis in Western Security, Croom Helm London, 1982, pp.121-143. See also the references in footnote 1. 47 On some of the shortcomings of strategic weapons systems see Andrew Cockburn and Alexander Cockburn, 'The Myth of Missile Accuracy', New York Review of Books, Vol. 27, 20 November 1980, pp.40-44. 48 'Effectiveness of Soviet Civil Defense in Limiting Damage to Population', United States Arms Control and Disarmament Agency Report Number 1, 16 November 1977, p.18. 49 John Cox, Overkill, Penguin, Harmondsworth, 1977, p.10. 50 Herbert York, Race to Oblivion: a Participant's View of the Arms Race, Simon and Schuster, New York, 1970, p.42. 51 Rotblat, (see footnote 9), p. 113; Bernard T. Feld, 'The Consequences of Nuclear War', Bulletin of the Atomic Scientists, Vol. 32, No. 6, June 1976, pp. 10-13.